Click here for a very nice richly-illustrated compilation of the history (in French) of a number of monuments, neighborhoods, and important events in the history of Toulouse. 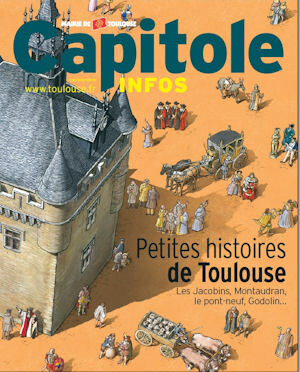 The chapters were published by the Toulouse mayor's office in various 2007-2019 issues of Capitole Infos and à Toulouse. Note: the file may take "a while" to download (about 250 pages, 75 MB). Toulouse, France's aeronautics and space exploration capital, can today afford to look skywards: its history has given it a solid base from which it can move towards the future with confidence. Nestled at the foot of the Pyrenees mountains that lie between it and Spain, the city known as "la Ville Rose" (due to the purplish-pink hues of its many brick buildings) has an immensely rich past, which through the centuries has alternated between periods of prosperity and much gloomier times. The city's history goes back over 2000 years, starting with the Volques Tectosages, a small Celtic tribe that settled in the Garonne valley around 300 B.C. Because of its strategic position, Toulouse - which provided a link between the Mediterranean and the Atlantic . Already in 100 B.C., it was of great interest to the Romans, who made it one of their colonies in the 2nd century A.D. The colony subsequently prospered from the wine trade and by the 3rd century A.D. it had its first city wall, which reached northwards as far as the Porterie (now Place du Capitole), while its southernmost point was Porte Narbonnaise, which is now Place du Salin and the Place du Parlement. Around this time christianity was introduced to the city by Saint Saturnin, who later died at the hands of a frenzied "heathen" mob who tied him to the tail of a bull. Many of the city's buildings and monuments named in his honor recall his martyrdom: Rue du Taur (from “taureau”, meaning “bull”), Notre-Dame-du-Taur church, Saint-Sernin basilica and Matabiau station (from matar bios, meaning “to kill the bull”). From the 5th century A.D., the city was subjected to barbarian invasions: while the Vandals were stopped by Gallo-Roman defenses, the Visigoths, who came from the area around the Black Sea, made the city their empire's capital. A century later, the Franks in their turn took possession of the city. By the 9th century A.D. there followed a period of relative calm when Toulouse found itself relegated to the rank of simple county town. However, during the Middle Ages it became capital of the County of Toulouse and governed by Raimond II. 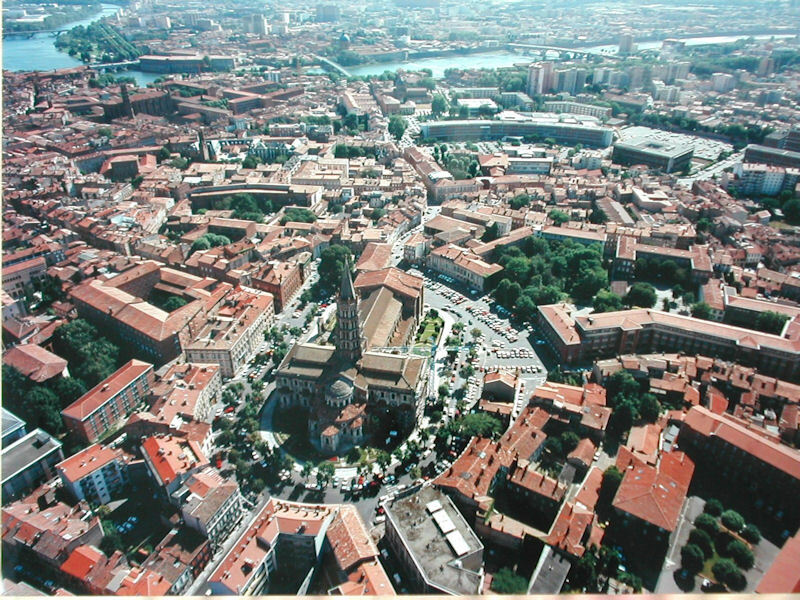 Ruled by city nobles, Toulouse quickly expanded, due to a large influx of settlers from rural areas. The city then stretched beyond its walls to the north as far as Place Saint-Sernin, to the south as far as the Saint-Michel area of the city and to the west on the left bank of the Garonne. In the 12th century, the nobility lost the city to the Capitouls or city consuls. In the 12th century A.D., the Cathars, members of a heretical sect, tried to establish themselves in Toulouse where they had many supporters. The king sent in his troops, led by Simon de Monfort (killed by a stone on the site where the Grand-Rond is today), which eventually succeeded in eradicating the heretics. As a result, the first wave of the Inquisition swept through Toulouse, bringing with it a religious fervour that was behind the founding of the Dominican monastic order in the couvent des Jacobins and, from 1229, the setting up of a theological university. Made a royal city in 1271, Toulouse experienced rapid economic growth (thanks to the Garonne river) and blossomed intellectually and artistically. However a dark period in its history was to follow from the 14th century onwards, when the plague, the Hundred Years' War, famine, floods and fire each ravaged the city in turn. The year 1420 was a turning point in Toulouse's history and marked the beginning of a wonderful century whose dominant theme was prosperity. Charles VII introduced a judicial body to the city: the Parliament. Pastel merchants, who had become rich by exporting this plant-derived blue dye throughout Europe, converged around the Grande Rue (today Rue des Filatiers, Rue des Changes and Rue St. Rome), built magnificent town houses (Hôtel d'Assézat, Hôtel de Bernuy) and took control of a wealthy Toulouse society in which architectural design and fine arts flourished. From the middle of the 16th century however, Toulouse experienced its second major crisis: indigo, a much less expensive dye, arrived from America, wiping out the pastel trade. A new civil war, this time between Catholics and Calvinists, caused an enormous fire to break out causing untold damage and up until the 17th century, famine followed on swiftly from the numerous outbreaks of the plague that befell the city. A period of development followed, which saw the coming to fruition of a number of industrial projects, such as the building of the Pont Neuf, Place du Capitole and the Canal du Midi. The Jean Calas affair caused uproar in 1761: accused of murdering his own son who wanted to become a Catholic, Toulouse merchant Jean Calas - in spite of protesting his innocence - was sentenced to death and burned alive in 1762. This prompted widespread condemnation by key figures in French society of Toulouse's Parliament's persecution of Protestants. Although somewhat hindered by the Inquisition and religious intolerance, the city was slowly but surely modernized during the 18th century. A period of urban reorganization began, which went on until the end of the 19th century. From 1750 onwards, Toulouse witnessed the building of the Jardin Royal, the Grand-Rond with its six splendid avenues, the Canal de Brienne, Quai Dillon, the Patte-d'Oie area of the city, Place Wilson and Place du Capitole. The opening of Matabiau station in 1856 heralded the age of transportation, while boulevards replaced the city walls and main thoroughfares were created at the end of the 19th century, following the example of the wonderful improvements made by prefect Haussmann in Paris. These large-scale projects were to give the city, which had long outgrown the original and very cramped medieval town, a whole new look. Meantime, the French Revolution of 1789 marked the end of the Capitouls' reign, and Joseph de Rigaud was voted in as Toulouse's first mayor. The beginning of the 20th century was characterized by a huge population increase, caused by the arrival of immigrants fleeing the numerous fascist regimes of the period (immigrants came from the north of France in 1914, from Italy in the 1920s and Spain in 1934). World-wide conflict forced the city, due to its strategic position close to Spain, to change and undergo its own industrial revolution, which resulted in the arrival of chemical industries in 1915, the Latécoère aircraft factory, and the setting up of Aéropostale, the French airmail service. Aérospatiale (the internationally-known aeronautics firm) was created here in 1920. During the Second World War, Toulouse's resistance network went from strength to strength during the Occupation. A new wave of immigrants arrived just after the war in Algeria and forced the city to spread further west towards the suburbs. Since then, industries - particularly the aviation industry - have continued to flourish, as have electronics and space exploration sectors. As France's fourth biggest city (metropolitan Toulouse has about 700,000 inhabitants), home to the country's second biggest university (and the first university outside Paris), and France's aeronautics capital, Toulouse is a dynamic, forward-looking city whose pinks (for its buildings) and blues (for its pastel) are a constant reminder of its rich and colorful past. The Garonne ("Garona" in Occitan, or lenga d'òc, or languedoc, a romance language, spoken mainly in southern France) is a river in the southwest of France, with a length of 575 km (357 miles). The name "Garonne" comes from the Latin Garumna, which is the transcription of the native name of the river in antiquity. This native name derives from the Aquitanian (language related to old Basque) word kar, meaning "rock", akin to old Basque karri (modern Basque harri, "stone"), and from a Celtic (or more probably Pre-Indo-European) suffix -onna which means "source, river", and which can be found in the name of many rivers of western Europe (such as the Seine, Saône, and Dordogne rivers in France). One of the reasons that Toulouse is at this particular location along the Garonne, is that it is one of the few places where one can wade across the river (esp. during periods of low water levels). Such a place is referred to in Latin as "vadaculum". The word has been transformed to bazacle in the local vernacular. Around 0 B.C., a shallow dam was constructed across the river at this point. These days, the current dam is normally (but incorrectly) referred to as "the bazacle". The river rises in the Val d'Aran (valley in the Spanish Pyrenees), flowing via Toulouse towards Bordeaux, where it flows into the Gironde river estuary. The latter flows into the Bay of Biscay. In its flow, the Garonne is joined by three other major rivers: the Ariège, the Tarn, and the Lot. Just after Bordeaux, the Garonne river finally meets the Dordogne river, after which the two rivers become the Gironde Estuary, which after approximately 60 miles joins the Atlantic Ocean. Other tributaries include the Save and the Gers. The Garonne is one of the few rivers in the world that exhibit a tidal bore. Surf boarders, jet-skiers etc. can ride the tidal bore as least as far upstream as the village of Cambes (110 km / 70 miles from the Atlantic). Major riverside towns: Bordeaux, Agen, Toulouse. The Garonne plays an important role in inland shipping. The river is not only allowing seagoing vessels to reach the ports of Bordeaux; it is also part of the Canal des Deux Mers, as it is the canal that links the Mediterranean Sea to the Atlantic Ocean, allowing a shorter and safer way for goods to pass from the agricultural areas of the South of France to the Atlantic. From the Ocean, ships pass through the Gironde Estuary, to the mouth of the Gironde, the left of the two rivers for those who sail upstream. The Garonne remains navigable for larger vessels up to the Pont de Pierre (Stone Bridge) in Bordeaux. River vessels can sail upstream to Castets-en-Dorthe, where the Garonne Lateral Canal (Canal Latéral à la Garonne) joins the river. The lateral canal takes the ships through 53 locks to the town of Toulouse, where the canal meets the Canal du Midi, with which its form the Canal des Deux Mers. The Garonne Lateral Canal was subject to one of the largest infrastructure works in Europe, when it was adapted to the standardized barge size of 38 by 5 meters, during the 19th century. French minister Freycinet ordered that all canals with importance for long distance transport be suitable for vessels of those standard dimensions. The extension of all the former 30 meter locks to the new standard length was carried out throughout the lateral canal. The other half of the Canal des Deux Mers, the Canal du Midi, partly escaped this operation, because by the time the works had reached the area where the most locks were situated, commercial traffic on the canal had almost disappeared. The works were stopped, leading to the cultural heritage status of the United Nations that has made the Canal du Midi famous.